Check out the Health Fair Map HERE! A healthy community is a more productive community, and Baxter Regional Medical Center, KTLO, Classic Hits-101.7 and The Boot believe that’s a goal worth pursuing! As one of the most successful Health Fair and Expos in the state, the upcoming 2019 event on April 24th and 25th is one you should put on your calendar! 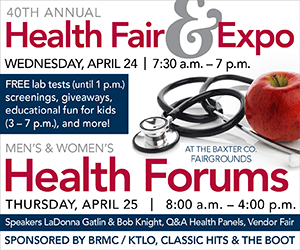 Drop by the Baxter County Fairgrounds main exhibit building to take advantage of all the free screenings, pertinent information from vendors on dozens of health and daily living issues, educational fun for kids, giveaways and prizes! Wednesday, April 24th, the doors open to the public at 7:30am, with BRMC departments and area vendors on-hand until 7:00pm to provide helpful and HEALTHFUL information. Included will be all aspects of senior and retirement living at its most fulfilling,and everything you need to make that happen! FREE lab screenings for cholesterol, triglycerides, blood sugar, prostate cancer and diabetes or prediabetes will be offered again, Wednesday only, from 7:30 to 1:00pm. A twelve hour fast is recommended for accurate results, so please—do not eat or drink anything but water or black coffee before your tests! Chicken fajitas will be grilled FREE to the public starting at 11:00am on Wednesday and will be available as long as they last! The Teddy Bear clinic, a new interactive event for children and their families, will be open from 3:00pm to 7:00pm Wednesday. Designed to help children become comfortable with basic check-up procedures, equipment, and care providers themselves, children are encouraged to bring their teddy bears for a “check-up,” or even minor “surgeries” to repair rips, re-attach eyes or limbs, etc.The Teddy Bear Clinic will also have some bears for “adoption” if a child needs one. Thursday April 25th, entertaining speakers will anchor the Health Forums for both men and women. The Women’s Forum presented by the Schliemann Center for Women’s Health Education from 8:00am to 10:00am will feature popular motivational speaker LaDonna Gatlin, sister of the well-known Gatlin Brothers. KTLO Expo vendors will then re-open their booths to the public from 10am to 2pm. The Men’s Health Forum, presented by the Mruk Family Education Center on Aging,begins at 2:00pm, and the keynote speaker will be KTLO, Classic Hits 101.7 and The Boot owner, General Manager and Morning Show personality Bob Knight. Begin your journey to a healthier, more productive lifestyle at the Health Fair and Expo, located at the Baxter County Fairgrounds, April 24th and 25th.